Here we go... it’s time to start planning for 3-day weekends and summer barbecues. Over the next 6 weeks, I’ll be sharing some of my favorite meals-for-the-masses on the blog, so make sure to check back in when you're in need of a keto-friendly dish! Living keto can be tricky when trying to incorporate this healthy eating lifestyle into being able to hang out or host get-togethers during the summer months. The typical potato salad, fruit salad or hot dogs and burgers with buns will no longer suffice. So what’s a keto peep to do? Have no fear, you’ll have all of the tools and recipes you need to make this the summer of weight-loss, well-being, and most importantly, fun! 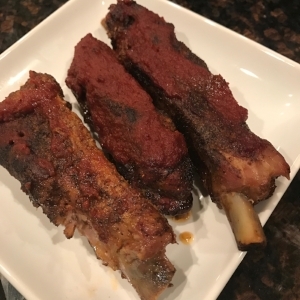 Today, I’ll be sharing my recipe for St. Louis Style Ribs and BBQ sauce. This is one recipe that takes a little time to prepare but... it's so worth it. It’s a crowd pleaser and, whether you’re cooking for other keto friends or not, everyone will be licking their fingers, looking for seconds. St. Louis Ribs tend to be a little tougher than the baby back ribs but when cooked slow and low, they will fall of the bone just like their counterparts. When you go to add the sauce, you can easily put these on the barbecue to finish them instead of putting them back in the oven. I like to buy my ribs from Whole Foods when they have their top-of-the-line, Step 5, on sale. If you aren’t familiar with Whole Foods and their labeling, Step 5 is their cleanest, most animal-centered meats where the animals live on the same farm for their entire lives. This is about as close to buying your meats straight from the farmer, as most people can get. Now, without further ado, it’s time for my finger-licking rib recipe. Mix all of the dry rub seasonings together. Take out 1 tsp of the rub to use in the BBQ Sauce (see instructions below). Lay the ribs out on tin foil on 2 baking sheets. Coat the ribs well with the rub. Wrap the ribs with more tin foil to seal them up. Bake for 4 hours. Start BBQ Sauce 1 hour before ribs will be ready (see instructions below). Take ribs out of the oven and spread the bbq sauce on them. Turn the oven up to 350 and place the ribs back in, uncovered. Bake for an additional 15-20 minutes. They should be tender and finger-lickin’ good. An hour before the ribs are ready for the sauce, mix all of the ingredients and bring to a boil and then turn the heat down to a simmer. Stir often and let it cook down and thicken up... about an hour.